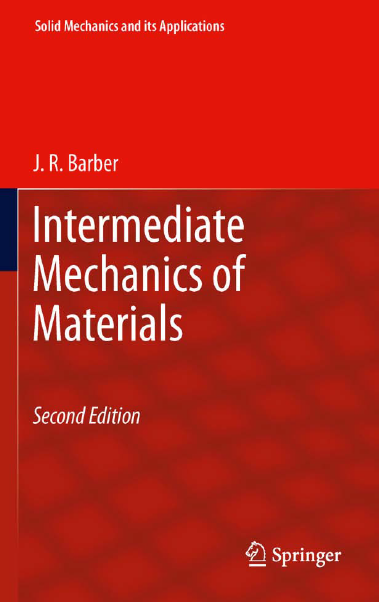 J.R BARBER ON "INTERMEDIATE MECHANICS OF MATERIALS"
axial loading, torsion, bending and shear. There is broad agreement as to the content of such courses, there are many excellent textbooks and it is easy to motivate the students by using simple examples with obvious engineering relevance. The second course in the subject presents considerably more challenge to the instructor. There is a very wide range of possible topics and different selections will be made (for example) by civil engineers and mechanical engineers. The concepts tend to be more subtle and the examples more complex making it harder to motivate the students, to whom the subject may appear merely as an intellectual exercise. Existing second level texts are frequently pitched at too high an intellectual level for students, many of whom will still have a rather imperfect grasp of the fundamental concepts. of this process in a capstone design project and this provides an excellent vehicle for motivating the subject. In mechanical or aerospace engineering, the second course in mechanics of materials will often be an elective, taken predominantly by students with a design concentration. It is therefore essential to place emphasis on the way the material is used in design. themselves of the dramatic difference between torsional and bending stiffness for a thin-walled open beam section by trying to bend and then twist a structural steel beam by hand-applied loads at the ends. 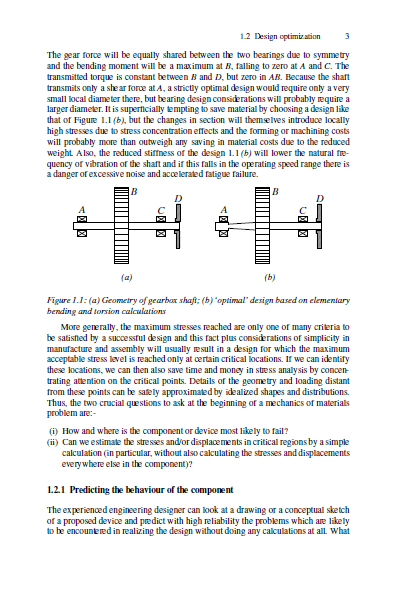 In choosing dimensions for mechanical components, designers will expect to be guided by criteria of minimum weight, which with elementary calculations, often leads to a thin-walled structure as the optimal solution. This demands that students be introduced to the limits imposed by elastic instability. Some emphasis is also placed on the effect of manufacturing errors on such highly-designed structures — for example, the effect of load misalignment on a beam with a large ratio between principal stiffnesses and the large magnification of initial alignment or loading errors in a column below, but not too far below the buckling load. No modern text of mechanics on materials would be complete without a discussion of the finite element method. However, students and even some instructors are often confused as to the respective rˆoles played by analytical and numerical methods in engineering practice. Numerical methods provide accurate solutions for complex practical problems, but the results are specific to the geometry and loading modelled and the solution involves a significant amount of programming effort. By contrast, analytical methods may be very idealized and hence approximate, but they are often quick to apply and they provide generality, permitting a whole family of designs to be compared or even optimized. The traditional approach to mechanics is to define the basic concepts, derive a general theory and then illustrate its application in a variety of examples. As a student and later as a practising engineer, I have never felt comfortable with this approach, because it is impossible to understand the nuances of the definitions or the general treatment until after they are seen in examples which are simple enough for the mathematics and physics to be transparent. Over the years, I have therefore developed rather untraditional ways of proving and explaining things, relying heavily on simple examples during the derivation process and using only the bare minimum of specialist terminology. I try to avoid presenting to the student anything which he or she cannot reasonably be expected to understand fully now. INTRODUCTION : Mechanics of materials is principally concerned with the determination of the stresses and deformation of engineering devices and structures. Stresses are important because, in combination with fundamental tests on engineering materials, they enable us to determine the loading conditions underwhichmaterial failure will occur. Deformations may also be important insofar as they affect the kinematic function of a device. As engineers, the principal use we make of such calculations is to provide guidance in the design process. Typically, we may perform a mechanics of materials calculation to determine the minimum dimension for a component if it is not to fail under the expected loading or, more generally, to choose between several competing designs on the basis of strength or weight. To ask the right questions in mechanics of materials, it is therefore important to have some understanding of the process of engineering design. The engineering design process : The engineering designer typically starts with a well-defined specification that the proposed device is required to meet, but no very clear idea of the form it is to take. The first step is therefore to generate a large number of potential solutions to the problem in an initial conceptual phase. This is a creative process and it is advantageous to give the imagination free rein by refraining deliberately from eliminating possible solutions based on any criteria other than the fundamental function of the device. stress, manufacturability etc. For a complex device, these arguments will initially only concern major characteristics of the design, details being left for determination at a later stage. Towards the end of the process, the choices will have been narrowed down to one or two only, and calculations will be performed to determine appropriate dimensions for the components. analysis may place an unreasonable delay between the initial concept stage and the device coming into production. returns to its original configuration after the load is removed. In this chapter, we shall use the more restrictive concept of material failure corresponding to situations in which an irreversible change occurs in the material in response to the applied stress field. Major categories of material failure include ductile failure or yielding, where the component does not return to its original state on unloading, brittle failure or fracture, where an originally coherent structure breaks apart catastrophically, and fatigue, where a progressive failure develops as a result of many cycles of loading and unloading. We shall see below that yielding is largely determined by the maximum shear stress and fracture by the maximum tensile stress in the body. Brittle failure and fatigue failure are characterized by the separation of the body into two or more pieces and are therefore always catastrophic, but yielding simply implies that the body is permanently deformed and this may or may not be acceptable in a given design application, depending on the function of the component. For example, if the crankshaft of an internal combustion engine is permanently deformed, it will cause additional dynamic loads due to out of balance mass, misalignment of the pistons in the cylinders and misalignment of the bearings and hence rapidly precipitate more serious damage to the engine. By contrast, a limited amount of permanent deformation of the members of a bridge structure may be acceptable. In the latter case, a more efficient design can often be achieved by analyzing the behavior of the structure in the plastic regime and applying appropriate safety factors.1 In order to predict whether a component will fail under a given load, we must first estimate the stresses at potentially critical areas and then compare them with the results of standardized material tests, such as the uniaxial tensile test. This procedure is based on the argument that failure is a localized process involving irreversible behavior at a particular point in the component. The material in the immediate vicinity of the failure site that participates in the process can only be influenced by local conditions. A particle of material embedded in a beam has no way of knowing whether the tensile stresses it experiences are the result of bending or tensile loading and therefore the tensile stress at failure will be the same for both modes of loading. Thus, differences in global loading conditions can only influence the material behavior insofar as they influence local conditions. Stresses are arguably the most important determinant of material failure, but other local quantities can be significant. For example, the yield stress may be temperature-dependent, in which case local temperature will feature in the yield criterion. For a simple loading geometry, the failure load can be determined by comparison with experimental results that produce a similar state of stress. For example, if a bar is loaded in bending, the stress state is one of uniaxial tension and the behavior of the component can therefore be predicted using the results of uniaxial tensile tests. In particular, plastic deformation will be predicted when the tensile stress reaches the yield stress SY for the material. However,many engineering components are subjected to more complex states of stress involving both normal and shear components. The most general state of stress involves six independent stress components—three normal stresses sxx,syy,szz and three2 shear stresses sxy,syz,szx. In principle, we might carry out tests to determine the conditions at failure under all possible combinations of these components, but in practice the experimental effort required would be enormous and the presentation of the data would require volumes of tables or graphs. To put this in perspective, note that, if failure depended on a single parameter (such as the maximum tensile stress), one experiment would suffice to determine it and the results could be presented as a single numerical value. If there were two parameters, the results could be presented as a graph or as a column of values. Three parameters requires a family of graphs or a table. Imagine what we would need to present results with six independent parameters! In this section, we shall examine ways of reducing the complexity of the problem, using a variety of arguments, assumptions and approximations. However, we must first review the relations between stress components in different coordinate systems, in order to determine the most efficient way of characterizing a given state of stress. equations alone are sufficient to determine the internal forces and the problem is described as statically determinate. By contrast, in statically indeterminate problems, the full system of equations must generally be solved, even if only the internal forces are required. Energy methods are an alternative to the direct approach— they do not provide additional information about the system, but instead generally replace one of the steps in the direct formulation. It is important to know which step is being replaced by a particular energy formulation, since otherwise wemightwrite what is essentially the same equation in two different forms and end up with a redundant system of equations. The advantages of energy methods will become apparent through the examples treated in this chapter. Notably, they can often be used to obtain the required answer without solving for a set of auxiliary quantities that are of no particular interest, and they also lend themselves to approximate solutions. In particular, they are central to the development of the finite element method, which is discussed in more detail in Appendix A. Energy methods are a subset of a broader class of methods based on the variational calculus and known as variational methods. 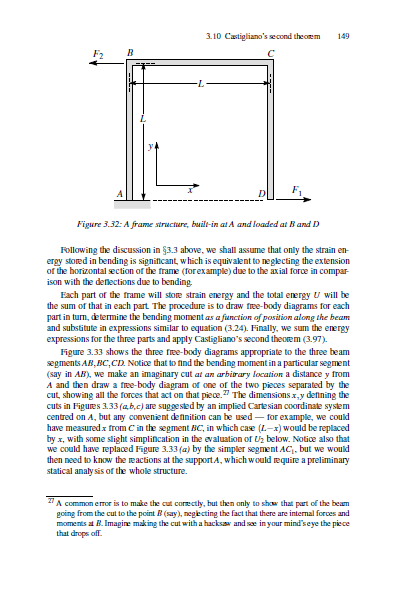 In fact it is possible to develop all the equations used in this chapter from purely mathematical arguments without ever making reference to the concept of energy. However, many of the following arguments will be easier for the reader to grasp in an energy formulation, simply because the physical ideas of conservation of energy and what is involved in doing work on a system can be called into play to aid our mathematical reasoning. Curved Beams : The classical theory of the bending of beams is strictly exact if the axis of the beam is straight, the loads are applied only at the ends and the cross section is uniform along the length, which is much larger than any other linear dimension. 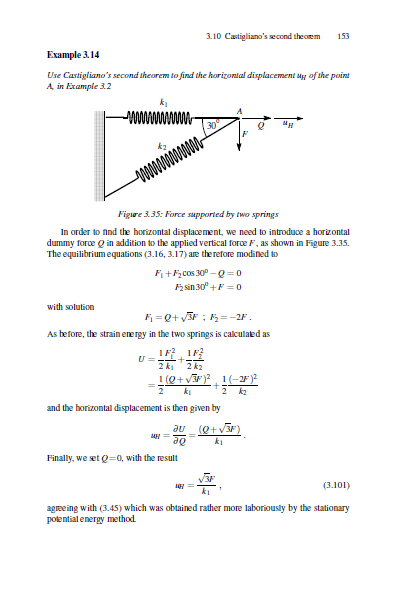 However, the resulting equations are so simple that engineers routinely apply them outside this restrictive context and this usage is appropriate as long as we recognize that the resulting approximation may underestimate the bending stresses. A particular case in which this occurs is that where the axis of the beam is curved. Important practical applications include chain links, crane hooks, pipe bends and curved segments of machine tool frames. Elastic Stability : In many design contexts, it is desirable to use components that have the minimum weight and cost compatible with acceptable values of strength and stiffness. The methods of the preceding chapters will often predict that the optimum design according to this criterion is a thin-walled structure. For example, we saw that closed sections are more effective at transmitting torques and that the strength and stiffness of such sections increases with the area enclosed by the section. It follows that the theoretical optimum torsion member for a given mass of material is a thinwalled cylindrical tube and the strength and stiffness theoretically increase without limit as the radius of the tube increases and the wall thickness correspondingly decreases . Thin-walled structures can indeed be quite surprisingly strong and lightweight —a result that is best appreciated by constructing simple structures out of paper and testing them to destruction. The Finite Element Method : Most of this book has been concerned with exact analytical methods for solving problems in mechanics of materials. Real engineering applications seldom involve geometries or loading conditions exactly equivalent to those analyzed, so the use of these methods usually involves some approximation. Nonetheless, the advantages to design offered by a general (symbolic) analytical solution makes them very useful for estimation, even when the idealization involved is somewhat forced. Numerical methods are appropriate when no plausible idealization of the real problem can be analyzed, or when we require results of greater accuracy than the idealization is expected to produce. 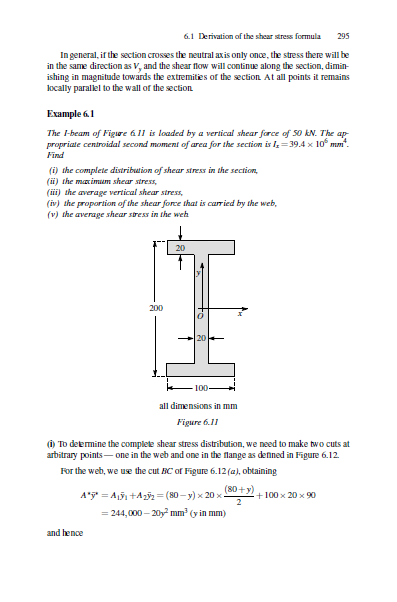 By far the most versatile and widely used numerical method is the finite element method and every engineer arguably needs to have at least some acquaintance with it to be considered ‘scientifically literate’. There is no room in a book of this length to develop the method to the level where the reader could either write his/her own finite element code or use a commercial code. Fortunately, most commercial codes are these days sufficiently user-friendly that one can learn to use them with minimal introduction from the manual, supplemented by the program help menu. All we seek to do here is to explain the fundamental reasoning underlying the method, introduce some of the terminology, and generally to remove the ‘mystique’ that can be a barrier to those not familiar with the method. In the finite element method, the body under consideration is divided into a number of small elements of simple shape, within each of which the stress and displacement fields are represented by simple approximations, usually low order polynomial functions of position. For example, in the simplest case, the stress in each element will be taken as uniform.